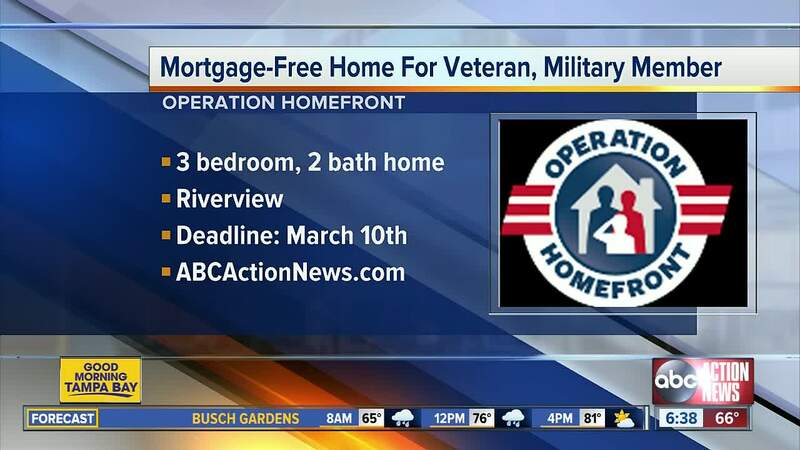 Operation Homefront is now accepting applications for a Riverview home, mortgage-free to a Veteran or military family. RIVERVIEW, Fla. — Operation Homefront is now accepting applications for a Riverview home, mortgage-free for a veteran or military family. The 2,162 square-foot home is one-story with three bedrooms and two bathrooms. Operation Homefront is a national non-profit that has been building mortgage-free homes for veterans and military families since 2012. Since 2012, nearly 550 families have graduated from the Homes on the Homefront program and have been deeded their homes, mortgage-free. Operation Homefront has provided over $77 million dollars in associated home equity to military families since inception. You can read more about the Riverview home and apply by clicking here.